Did you ever think that there was more to life than being really really really ridiculously good-looking? 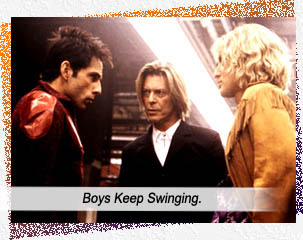 Written by Stiller, Drake Sather and John Hamburg, ZOOLANDER follows Stiller, as the eponymous Derek Zoolander, a “really really really good-looking” male model, three-time winner of the Male Model of the Year Award, on his journey of self-discovery, from self-involved Male Model who trademarked the “looks” Ferrari, Le Tigre, and of course, Blue Steel (I’ve always been a fan! ), to the realization that his good looks and incredibly chiseled abs could be used in founding The Center For Kids Who Can’t Read Good. Existing on minimal brain activity, Derek lives with three other Male Models, apparently as intelligence-challenged as he, Brint, Rufus and Meekus. When they all meet a grisly end in a gas station explosion, Derek calls it a “freak accident” in his “eugoogly” – the fact that they were effeminately hosing each other with gasoline (in characteristic slow motion Male Model idiom) and then lighting a cigarette doesn’t solve the mystery. So begins Derek’s journey through the seedy underbelly of Male Modeling – Malaysian child labor for stylish slacks, the assassination of Kennedy by “two lookers on the grassy knoll,” and his own brainwashing by crooked fashion designer, Mugatu (Will Ferrell, as outré as he wants to be, in poodle haircut and petulance flambé), to kill the Malaysian Prime Minister who opposes child labor laws (because that would stop the flow of stylish slacks). Derek’s subliminal signal – of all things – is eighties dance-slash-gay hit, Relax by Frankie Goes to Hollywood. Along the way, he must face-off (or “walk-off,” as the Male Modeling case may be) a new youngblood uber-hippie toy-boy, Hansel (Owen Wilson). When Derek loses Male Model of the Year to Hansel, in an attempt to desperately re-flame his career, he accepts an assignment from Mugatu, and all posing breaks loose. Who knew THE MANCHURIAN CANDIDATE would end up down Derek Zoolander’s tight trousers? Investigative journalist, Matilda (Stiller’s delectable real-life wife, Christine Taylor, eternally Marcia Brady), must save Derek from Mugatu’s plot, and seek asylum with Derek’s mortal enemy, Hansel, whom they discover idolizes Derek. Will Ferrell is so funny in this movie as crooked fashion icon, Mugatu, that we were all fooled into thinking he was a comedian. Until film-makers made the mistake of letting him star in his own movies… (UNRELATED SIDE-NOTE. Mugato: continually mispronounced as “Mugatu” by Captain Kirk on STAR TREK episode No. 45 A Private Little War, the Mugato was a goofy carnivore-ape-thing (resembling an albino version of The Rhino, a fruity supervillain from Spiderman comics), that put Kirk in a coma). Jerry Stiller (Ben’s real dad) is Maury Ballstein, Derek’s agent; Jon Voight is Derek’s miner dad, ashamed of his son being a mermaid in a commercial (“MerMAN! MerMAN!”). Roaring cameos by David Bowie, Billy Zane, Fabio, even Paris Hilton! ; David Duchovny appears, unrecognizable, to mumble about – what else? – conspiracy. An insensate homage to insensate Male Models everywhere, ZOOLANDER is one of the funniest comedies ever made, because it never loses its way in the third act, where many laugh-a-minute movies turn into drama or chase films. ZOOLANDER gleefully retains its flamboyant extremism and piles on the idiocy to the very last frame – the fountain dedicated to Derek’s tragically deceased Male Model friends, splishing only water from their stone petrol hoses this time, sploshing out front of The Derek Zoolander Center For Kids Who Can’t Read Good And Who Wanna Learn To Do Other Stuff Good Too. Writers: Drake Sather, Ben Stiller, John Hamburg. Starring: Ben Stiller, Owen Wilson, Christine Taylor, Will Ferrell, Milla Jovovich, Jerry Stiller, Nathan Lee Graham, David Duchovny, Jon Voight, Vince Vaughn, Alexandre Manning, Asio Highsmith, Alexander Skarsgård.